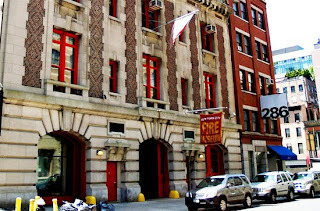 The NYC Fire Museum: An historical building filled with antique fire engines, buckets, call boxes and all sorts of paraphernalia. Bring a stool and lots of red paint for an afternoon adventure on a chilly fall day. Weather permitting (over 50 degrees) anyone interested in sketching the exterior can meet at noon in front of the building. TRANSPORTATION: C OR E Train to Spring St. Then walk west 1 1/2 blocks. Please RSVP directly to Raylie Dunkel at raylie@verizon.net. Looking for us? Call Raylie at 201-978-6387.